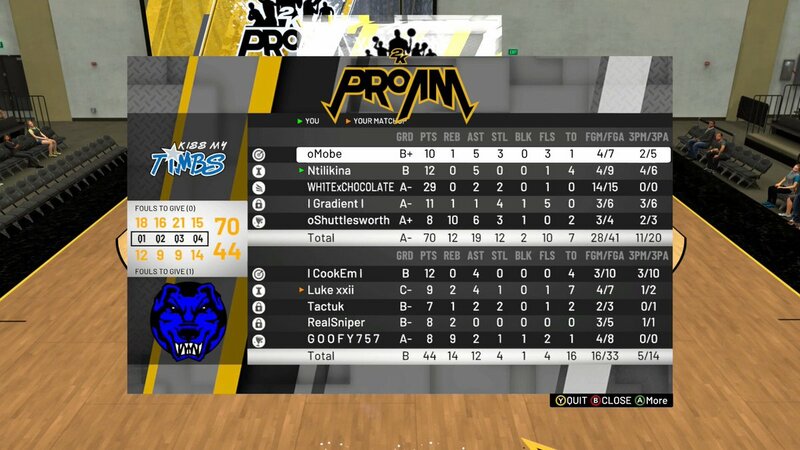 KissMyTimbs (KMT) defeated Breakout 70-44 in an emphatic performance, forcing 16 turnovers and outscoring the nouveau Xbox arrivals 55-30 in the first three quarters. This scouting session is focused solely on the five members of KMT, not on any Breakout players. I prefer to judge league players on their performance in the league, and KMT made the small contributions of Breakout’s two non-league players completely irrelevant. This will mostly consist of clips and induction thereof. Gradient is a phenomenal defender, but Shuttlesworth more than holds his own too. He’s not a lock in the sense that Gradient is, and he has what to improve on in terms of on-ball defense, but most importantly he’s a smart player. Smart players can be taught. A great play to step in front of that pass to the guy cutting backdoor. If players have talent, smarts, and the will to win—Shuttlesworth does—teaching them is all the more worth it. The two project more as secondary ballhandlers in the league, I think. There’s a little more court vision to be developed and more consistent decisiveness to be employed. Both—and this is a symptom to which 99.9% of point guards are not immune—are a little too prone to dribbling ineffectually to the elbow and picking up their dribble, stalling the possession. Mo, I think, hit a walkback jumper there, but the path to consistent offense does not run through occasional elbow jumpers. That’s smart playmaking and unselfish decision-making. More of that, please. The team as a whole communicated very, very well. Choc has a sky-high IQ and is never afraid to voice his opinion. He devastated Breakout time and time again in transition, timing his leaks very well and capitalizing in transition as a result. He also proved more than capable when switched onto Dimez (most do), boxing the former No. 1 overall pick, and he swiped the ball from Scretty several times. Twenty-nine points is nothing to scoff at.